A budget friendly best-seller in the market, Genesis’ Tomahawk is certainly going to bat eyes everywhere you go. It comes in three colors, is super flexible and thin. Not only does it look great, but also feels great while riding- equipped with brushless motors, a motherboard for power management, and long lasting rechargeable batteries! The Tomahawk has a hill grade of 15 degree, which means that it’ll do all the uphill work for you, with ease! At the low price it comes in, it offers excellent features, and reliable support- no wonder it’s the most sought-after board of the year! 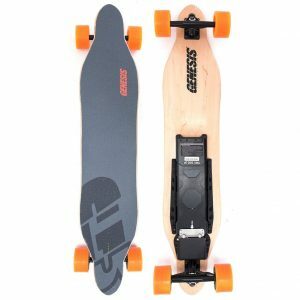 Is Genesis Tomahawk Electric Board Safe? How Cost Effective Is Genesis Tomahawk? The deck of the Tomahawk is made of eight layers of graded, fine Maple wood from Canada, which is 42” in length and 8.5” wide. 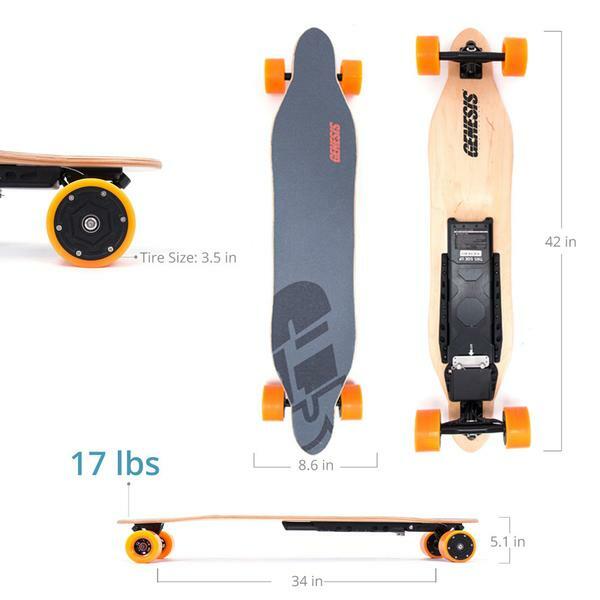 It meets the dimensions of a longboard, and can hold up to 264 pounds in rider weight. The wheels come in three colors- black, green and orange, which are sturdy polyurethane, 3.5” in diameter, which can roll smoothly over stones and grit! The battery is located next to the rear bridge, in an Aluminum Housing, coated in black. It also holds the motherboard, and is secured with battery pack screws. The top part of the board has 36 grit grip tape, with particle size of 530 micro meters, and is grey, with the Genesis Logo printed across. The board is super stylish, and is well streamlined for a worry-free cruise! The Genesis Tomahawk (at full charge), will give you a decent range of 20 miles, at a max speed of about 20 MPH. This may vary depending on user’s weight, weather and road conditions. The board runs on 36-volt, 4.3Ah-4.4Ah batteries, which are replaceable, and take around two and a half hours to recharge. The batteries weigh 3.7 lbs., and they are premium quality 18650 lithium ion batteries. It comes with a wireless remote, which has a frequency range of 2.4 MHz, with 300 mAh capacity. The remote takes half an hour to recharge, and is powered by li-on batteries. It resembles a tv remote, and is easy to handle. The motors are at the back, which are dual brushless ones, each giving about 260W worth of power, totaling around 520W. The system control box is located at the motherboard, with a chip which connects to the remote. There are also different ride modes. The deck also has a LED battery indicator, for safety purposes. The board can easily go over hills which have an incline rate of 20 degrees or less. The board comes with a UL certification, along with IPX4 Water Proof rating, which means that the whole battery setup, and the motors are free from electrical mishaps on coming in contact with puddles, or during heavy downpour. The board comes with LED battery indicator lights, which are easy to take note of, and extremely reliable. You can also ride it manually, since it is brushless. With secure grip tape running the full length of the board, you can be assured that sudden breaks will not make you fall off or lose balance. The board has three ride modes and cruise control as well, for safer, more secure riding. The board is available for $499 on the official website, which is totally worth every cent considering the top-notch support and power it provides. Upgradable batteries are soon to hit the market, which will increase the max speed and range, so for $499, this board is doing extremely well! The board comes fully set up, with an instruction manual, the wireless remote and charger, the battery charger, and a kit. This board is a must buy, for all those on a budget, looking out for upgradable boards, with existing benefits!